When people express anxieties about immigration, they tend to do so in terms of its economic, social or cultural effect on the country – and occasionally all three. Of these, the social effect of immigration continues to be the most divisive, with strident voices expressing bitterly opposing views. As far as the other two are concerned, most people (outside a relatively small minority) feel that the cultural impact of immigration has been largely beneficial: the food we eat, the music we listen to, the sport we follow, the actors in the plays and films we watch, the fashion that excites us – all of these have been unquestionably enhanced by the influence of people coming to this country from elsewhere. 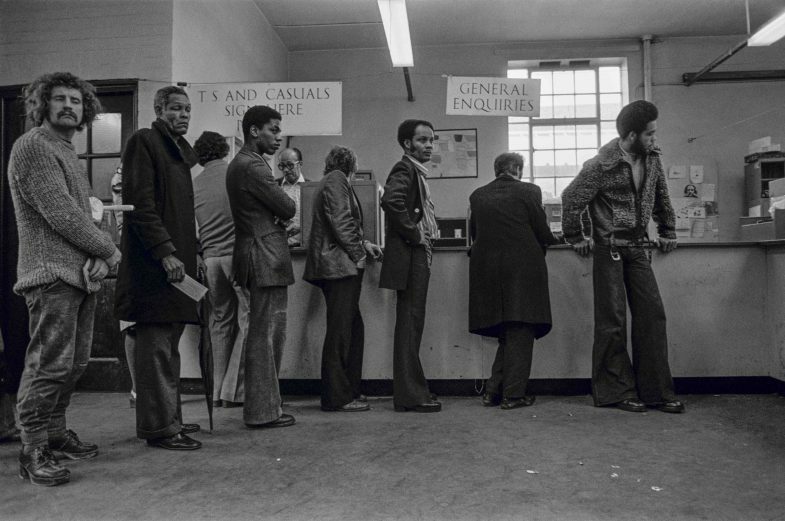 The economic impact is more finely nuanced: while some people claim there is an incontestable benefit in terms of the energy, the dynamism, the ambition and the entrepreneurism of many immigrants, others claim that the jobs immigrants take could have gone to ‘native’ ‘Britons’ (both of which terms are highly controversial). But then, say others, ‘native’ ‘Britons’ are not taking these jobs in any case and, besides, there are not enough such ‘natives’ to look after our increasingly ageing population. It is this aspect of the economic impact of immigration that Dr Zsóka Kóczán examines in the guest blog that follows. The blog is taken from a longer article Zsóka co-authored with Benjamin Hilgenstock in 2018, ‘Storm Clouds Ahead? Migration and labor force participation rates in Europe’ (IMF Working Paper No. 18/148). Over the months to come, we hope to feature other blogs by Zsóka on other aspects of the immigration debate. Population growth in most advanced economies is slowing, life expectancy is rising and the number of elderly people is soaring. These trends are expected to accelerate further: the United Nations projects that by the middle of this century the total population will be shrinking in almost half of all advanced economies. Those of working age will be supporting close to double the number of elderly people they do now. Understandably, this raises huge concerns about the sustainability of pension and health care systems and social safety nets. 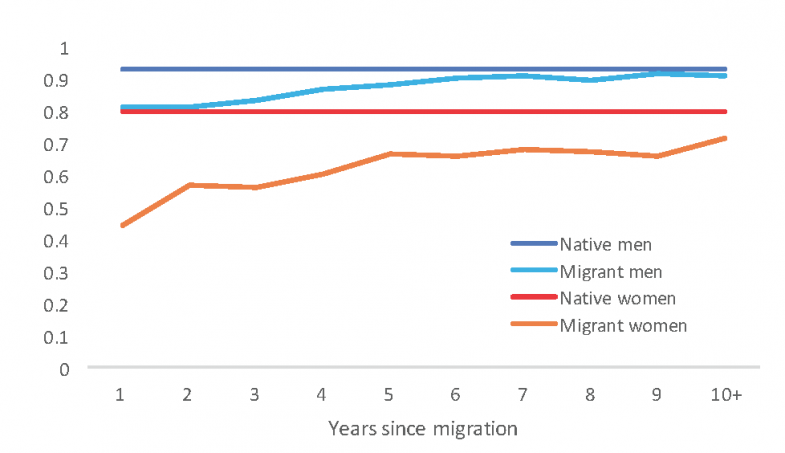 Migration has, so far, mitigated some of the effects of ageing. 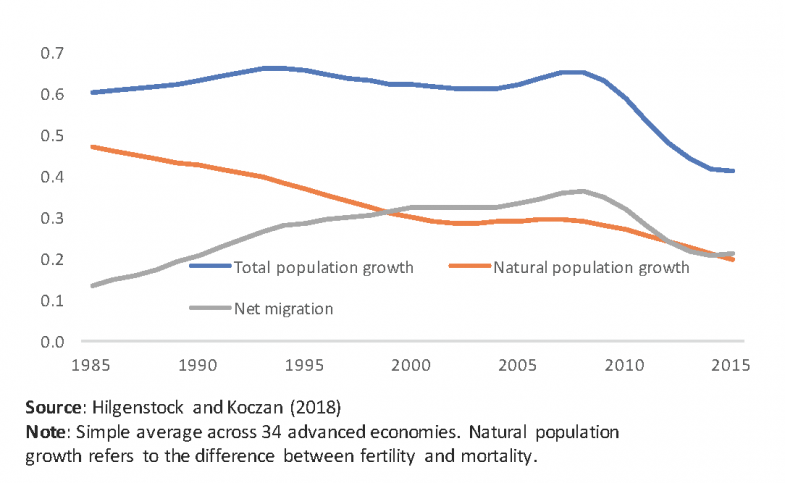 Since the mid-1980s natural population growth, measured as the difference between fertility and mortality, has been falling in most advanced economies, while net migration (the difference between those leaving and those arriving) has accounted for about half of the population growth (see Figure 1). Migrants are more likely to be of prime working age (i.e. aged between 25 and 54) than natives because they arrive, typically, after they have completed their education and often leave when they retire, as Renzo (2017) noted for the UK (see Figure 2). Because participation in the labour force, as measured by the proportion of the adult population working or looking for work, is highest among those in this age group, migration can help to increase overall participation. As Coleman and Rowthorn (2004) highlighted for the United Kingdom, immigration’s substantial demographic and economic benefits are much larger than its mostly small or transient economic costs. There are also, however, differences between migrants and natives in the rates of participation in the labour force, and these differences vary by gender and age (see Figure 3). 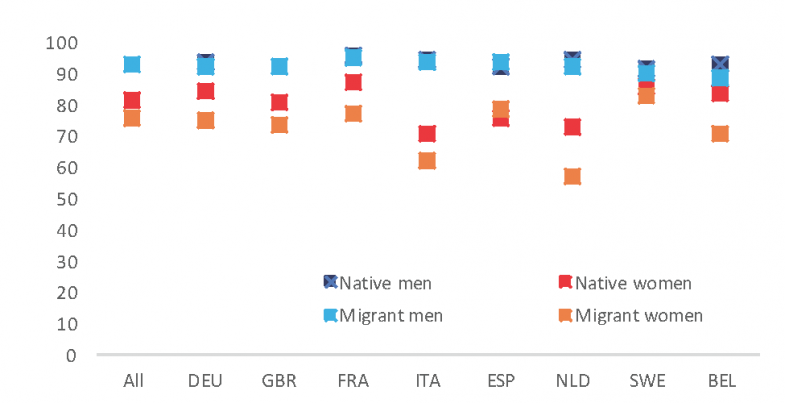 Data from 25 advanced European economies from the European Union Labour Force Survey suggests that prime-age migrant men’s participation is very similar to that of prime-age native men (both around 92 per cent in the UK), while participation is significantly lower among prime-age migrant women than among prime-age native women (74 and 80 per cent respectively in the UK). Young migrants are more likely to be in the labour force than young natives (as young natives are on average more likely to be in education), but participation among migrants aged 55 and older is slightly lower than for natives in the same age group, again largely because of lower participation among migrant women. What is holding back migrants’ involvement in the labour market? Migrants’ participation decisions are shaped by many of the same factors that shape those of natives. People who are more educated participate more. Being married and having children typically increases the odds of participation for prime-age men, but lowers it for prime-age women. Working or having worked in an occupation with a higher share of tasks that could be automated is associated with lower odds of participation. Migrant participation rates converge toward those of natives over time: participation increases with years in the host country, especially for prime-age women. An additional year in the host country is estimated to increase the odds of participation by 4–7 per cent, even when individual and household characteristics are taken into consideration (see Figure 4). As noted by Cooper, Campbell, Patel and Simmons (2014) in an in-depth study of the labour market outcomes of migrants and natives in the UK, migrants from the European Economic Area tend to do better in terms of employment outcomes than those from outside it, and those who came for work purposes do better than refugees. This is also in line with the earlier findings of Dustmann and Fabbri (2005) on immigrants in the British labour market. However, there also appear to be significant differences between the drivers of the participation decisions of migrants and natives. For instance, being married and having children has larger negative effects on the participation of migrant women than on native women. While some of this discrepancy could be due to differences in attitudes and social norms, institutional obstacles also appear to be holding back migrants’ involvement in the labour market. In particular, a key difference between migrants and natives relates to the effects of education on participation. Migrants are on average somewhat less educated than natives in advanced European countries, and this difference is particularly pronounced for women: 26 per cent of prime-age migrant men and 27 per cent of prime-age migrant women only got as far as lower secondary education, whereas 20 per cent of prime-age native men and 18 per cent of prime-age native women progressed beyond this. However, in addition to these differences between average education levels, higher education increases the odds of working or looking for work less for migrants than for natives. One potential reason for this finding could be the difficulty migrant workers may face in getting the same benefits (in terms of a higher likelihood of employment) from higher education as natives. This would also be consistent with the large literature on migrant wage gaps, which suggests that even taking into account that migrants and natives may differ in terms of their other characteristics (such as their education levels or language skills), migrants tend to earn less than natives, possibly because they have difficulty having their qualifications recognised (see for instance Schmitt and Wadsworth 2006, Coulombe, Grenier and Nadeau 2014). The Migrant Integration Policy Index (MIPEX) indicates how easy or difficult it is for migrants to get their academic and professional qualifications recognised and skills validated. An examination of two country groups – countries with more favourable policies in this respect (including the United Kingdom, Belgium, Germany, the Netherlands, Portugal and Spain) and countries with less favourable policies (including Austria, France, Greece, Ireland, Italy and Luxembourg) – shows that there are smaller differences between natives and migrants in countries with favourable policies for upper secondary education. Favourable policies also increase the positive effects of tertiary education on the odds of participating for both natives and migrants, though they do not reduce the difference between them. 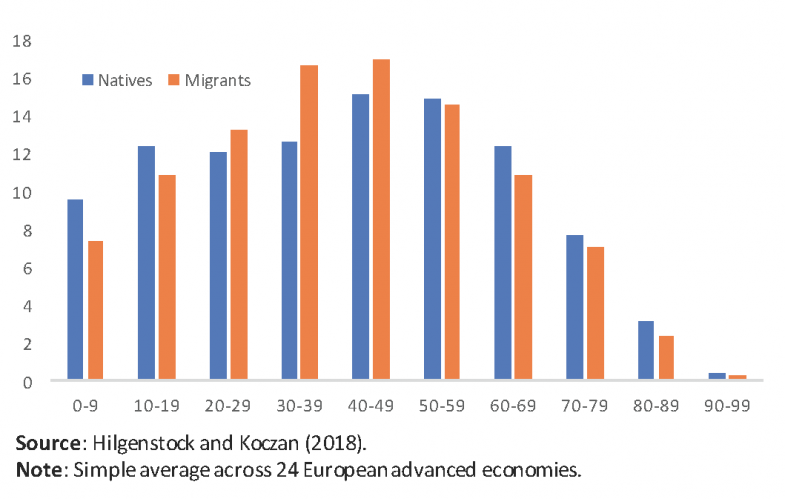 Overall, migration thus plays a very significant role in alleviating the pressures of an ageing population, largely because migrants are more likely to be prime-age than natives. If it weren’t for migration, the decline in labour force participation would be significantly deeper. Policies that support migrant integration, such as recognition of educational qualifications or language training, could, however, further increase the positive economic effect of migration in advanced economies. This could help mitigate some of the future negative effects of ageing and help make social safety nets more sustainable in these economies. Higher migration flows could also contribute more broadly to the supply of labour and the host economy — increasing output per capita by boosting demand and investment, contributing to technological progress, and increasing labour productivity. Coleman, David and Rowthorn, Robert (2004) ‘The Economic Effects of Immigration into the United Kingdom’, Population and Development Review 30(4): 579–624. Cooper, Jacquie, Stuart Campbell, Dhiren Patel and Jon Simmons (2014) ‘The Reason for Migration and Labour Market Characteristics of UK Residents Born Abroad’, Home Office Occasional Paper No. 110. Coulombe, Serge, Gilles Grenier and Serge Nadeau (2014) ‘Human Capital Quality and the Immigrant Wage Gap’, IZA Journal of Migration 3(14). Dustmann, Christian and Fabbri,Francesca (2005) ‘Immigrants in the British Labour Market’, Fiscal Studies 26(4): 423–70. Hilgenstock, Benjamin and Kóczán, Zsóka (2018) ‘Storm Clouds Ahead? Migration and Labor Force Participation Rates in Europe’, IMF Working Paper No. 18/148. Schmitt, John and Wadsworth, Jonathan (2006) ‘Changing Patterns in the Relative Economic Performance of Immigrants to Great Britain and the United States, 1980–2000’, Centre for Economic Performance Working Paper No. 1422. Rienzo, Cinzia (2017) ‘Characteristics and Outcomes of Migrants in the UK Labour Market’, Migration Observatory Briefing. Dr Zsóka Kóczán is an Economist in the World Economic Studies Division of the Research Department at the International Monetary Fund, having worked previously in the European Department. Before joining the IMF in 2013, she worked at the European Bank for Reconstruction and Development. She holds a PhD from the University of Cambridge and is interested in applied microeconomics, inequality, and migration. The views expressed in this blog are those of the author and should not be attributed to the IMF, its executive board, or its management.